Brooklyn Peddler 4-Tone Pinewood Train Whistle You're standing on a steam-filled platform, your dearest love in your arms weeping, swearing she will return to you, swearing time will not erase the love that has grown and that one day, one day she will come back. You close your eyes and embrace - a train whistle blows. 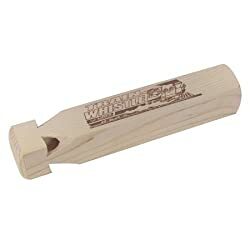 You open your eyes, and it turns out you dozed off watching sports center again, and your 5 year old has picked up his 4 tone pinewood train whistle and is blowing for all he's worth.